Expect a hungry crowd at Coachella. 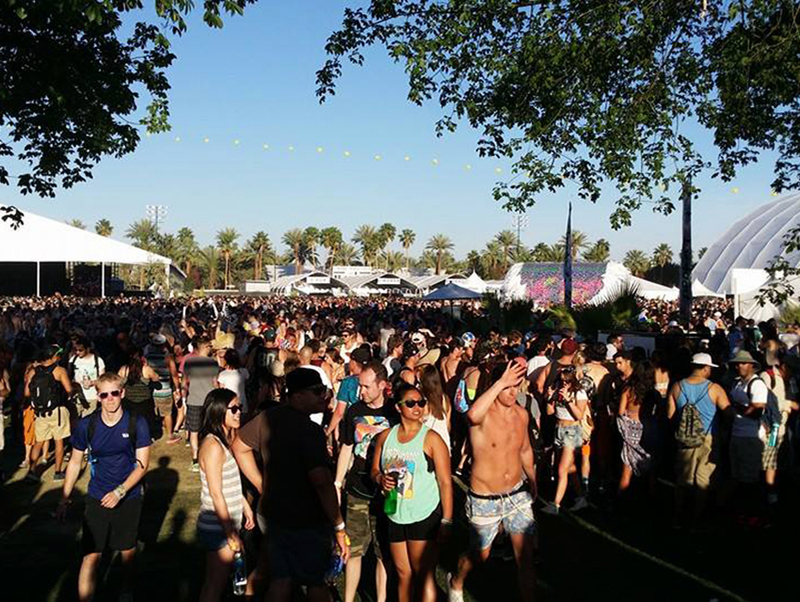 At the 2014 Coachella music festival, the most buzzed-about headliner wasn’t OutKast or even Beck but the elevated food lineup that debuted, boasting restaurants like Baco Mercat and Night + Market, craft cocktails from L.A. hot spots like Honeycut, a craft-beer barn, and even a formal white-tablecloth dinner. Food-loving festival-goers were ecstatic. Finally, they had options other than the usual greasy festival fare. And, naturally, after an impressive first impression, there’s a killer food lineup this year. Not only have last year’s popular craft-beer barn and the Outstanding in the Field dinners ($225 this year) returned, but sit-down dinners with $50 prix-fixe menus by Roy Choi’s Pot and Kris Morningstar’s Terrine are also part of the lineup. Perfect for those who want to have a nice meal but don’t want to blow all their cash on one dinner. This year, general-admission folks will get some love too, with the craft-beer barn featuring eateries like Beer Belly and 800 Degrees, and yurts on the Terrace serving up artisanal items like coffee, jerky, and juice. Back in the VIP sections, Grand Central Market star Eggslut will be in the Rose Garden while Dante’s Fried Chicken and The Church Key will be in the main VIP area. Just because it’s general admission doesn’t mean you’re screwed. Everyone has access to all the craft-beer goodies at the beer barn, the small-batch snacks at the yurt marketplace, and quality meats from Custom Butcher and Mexican food from Pinches Tacos. These huts on the Terrace and near the craft-beer barn will once again offer an array of tasty pick-me-ups from pressed juices to pour-over coffee to filet mignon jerky. This was my other favorite spot to seek refuge from the crowd and the occasional sandstorm. Since it was way on the other side of the festival, it wasn’t as impossibly crowded as the main VIP area. Plus, it’s where you can find craft cocktails. Just grab some shade by a palm tree and enjoy your refreshing drink and gourmet bite. This $225 four-course meal at the festival is certainly a splurge, but you get a lot for your money. Not only are you enjoying a delicious meal by a big-time chef, but it also comes with booze (cocktail, beer, wine)–and if you time it just right, you get to hear your favorite band live on the nearby stage while having dinner. There are two seatings (5:30 p.m. and 7:30 p.m.) available every day on each weekend. Plus, the big news is that chef Ricardo Zarate (Picca) is back from wherever he disappeared to, and pastry wizard Nicole Rucker is making one of her first appearances since leaving Gjusta. Make your reservations before the festival on the Reserve app or visit here to buy tickets to the dinner and passes to the otherwise sold-out festival. Steve Fretz of The Church Key says one of the dishes he will be serving up is ricotta cavatelli with lamb ragout, green olives, kale, and pecorino cheese, as well as a Bloomsdale spinach salad with Harry’s Berries strawberries, pickled red onions, blue cheese, pine nuts, creamy balsamic dressing, and crispy shallots. Even though this is VIP, it’s still crazy packed thanks to its proximity to the VIP entrance and the stages. Prix-fixe meals are $50 per person. Like for Outstanding in the Field, use the Reserve app or check in at the host stand in Main VIP during Coachella. Or you can try your luck the day of and walk up to see if there are any available seats. Pot is definitely the most buzzed-about dinner thanks to Roy Choi’s red-hot celebrity, but I’m liking the idea of fancy Terrine in the festival setting. And The Gadarene Swine/Scratch Bar combo should satisfy those in search of healthy vegetable dishes and/or refined pub food. Pot by Roy Choi: A mix of Pot hits like banchan, hot pots, barbecue dishes, and Pot Cafe dessert.